The strapline on the City Light ad is in English: "Work Hard. Have Fun. Make History" . It is a recruitment ad for Amazon, quoting a line from its founder Jeff Bezos. Amazon is not actually launching on the Czech market, but it is opening both a logistics centre near Prague, and an administrative centre in Dejvice. How the people there will "make history", remains to be seen. But before they start , they deserve to know how Amazon is perceived in the European markets where it does business. In its early years, I was almost as enthusiastic about Amazon as I was about Apple. I would say that Amazon got me reading books again. I was delighted that Amazon seemed to have finally brought the price of CDs in the UK down to a sensible level. The ease of use of the website was amazing at the time. The customer service was excellent too. You would write an email and get a reply very quickly. They were happy to send books and CDs to a Czech address for reasonable prices. If your parcel didn't turn up, they just sent you another one. Once, my original parcel turned up four weeks later, so I wrote asking if I should return it. "No, it's OK, thanks for asking" came the pleasant reply. Then came the Kindle, a brilliant invention, which made book reading and buying even easier. Any company which gets the world reading more books, is entitled to be pleased with itself. But those of us who bought mainly books and CDs from abroad did not notice how Amazon was expanding. Nor did we realise the significance of something odd on our sales invoices: for some reason, we were apparently doing business with an Amazon company based in Luxembourg. Amazon had moved into just about every market sector whose goods you could send by mail. Well why not, if you can offer a competitive service? Unfortunately, as so often, it seems that there is a hidden price to pay for this service. Amazon takes an age to pay its suppliers : 96 days according to this article. It became involved in a vicious battle with Hachette over the pricing of e-books; Amazon's tactics enraged some of the world's most distinguished authors, who felt that they had been used as "hostages" in the negotiation process. However what really bothers people in the UK nowadays is the fact that Amazon pays so little corporation tax there. At the heart of the controversy is that invoice from Luxembourg . I order my Mum a CD from Amazon UK; it is delivered from one of Amazon's many huge logistic centres in the UK, to my Mum's London address. Yet, it emerges, that because Amazon have included an electronic invoice with a Luxembourg address on it, they argue that my transaction with them was "concluded" in Luxembourg; despite the fact neither I, my Mum nor the CD have been anywhere near Luxembourg. It turns out that not only were Amazon taking advantage of low corporate tax rates in Luxembourg, but it had negotiated a special deal with the Luxembourg government, which is now being investigated by the European Commission. And who was the Prime Minister of Luxembourg who negotiated this deal? Why none other than current EC president, Jean-Claude Juncker. Well I suppose we could all try this trick. Let's say that I discover a long lost relative in Dublin,Ireland, where corporate tax is lower than in the Czech Republic, and use his address and computer to send out invoices. I find an account director for an agency in Prague, but my invoice comes from an address and seeks payment to a company in Dublin . So all of a sudden my Czech company has no revenue and trades at a loss. Now what do you think the Czech tax office would think and do about that? Indeed Amazon is making history. It is one of several giant multi-national companies who stand accused of not paying corporate income tax on huge business. It directly affects rivals; the respected CEO of UK retailer Sainsbury, Justin King, called on consumers to boycott Amazon. But most of all it affects taxpayers. If huge companies like Amazon win business from more traditional companies, but then do not pay corporate tax, the small taxpayer has to pay more tax to maintain the country's services and authorities. It's a pity. Amazon started making history in a good way. What a shame then, that it grew so powerful that it felt it could get away with bullying suppliers, going against standard employment norms, and ultimately telling fairy tales in order to avoid tax. 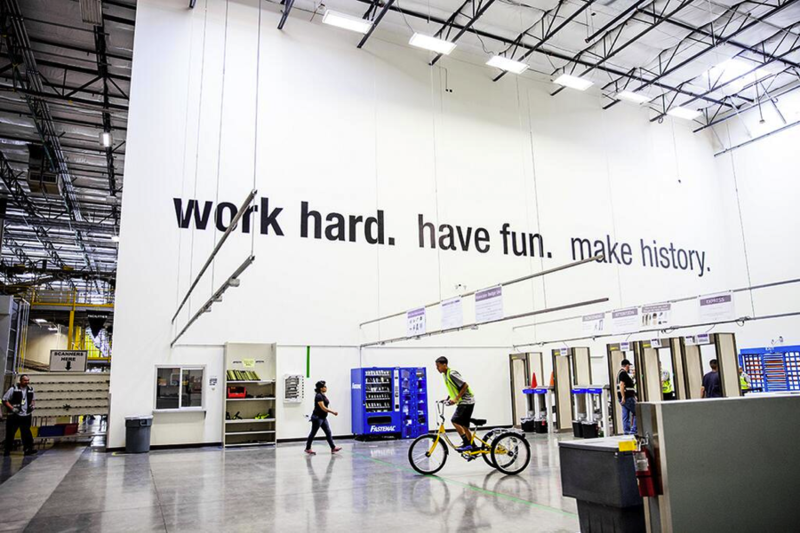 Maybe Amazon has a job for you in its shiny new Dejvice office. And maybe you will indeed have fun. Bu you should ask yourself if you are now old enough not to believe in fairy tales.